The Senate minority leader has abused the filibuster since 2007, but if continues to filibuster presidential appointments, Harry Reid is prepared to change the Senate rules. Mitch McConnell has since 2007 been maintaining a rogue branch of government. Though the Republican leader in the Senate lacks any constitutional grounding, though he has no popular mandate and though he leads only a minority of senators, McConnell has defined the range of debate and steered the direction of the federal government by engaging in the most aggressive abuse of the rules in the history of the chamber. That abuse involves a redefinition of the traditional filibuster power as a veto that the minority can use to undermine not just legislation and presidential appointments but the very functioning of the federal government. The founders of the American experiment imagined no such veto. In fact, the US Constitution imagines a system under which the legislative branch provides advice and consent to the executive branch. But McConnell has so exaggerated the filibuster power that it has effectively allowed him to thwart not just Senate votes but the operations of federal agencies such as the National Labor Relations Board. He and his allies have gone so far as to block the confirmation of nominees for cabinet posts, such as Department of Labor nominee Tom Perez. McConnell’s crew has done this with a consistency that extends far beyond specific issues or individuals. They have created systematic obstruction, which allows the minority leader to “govern,” even though he lacks any authority to do so. When Lyndon Baines Johnson was the Senate majority leader in the contentious 1950s—an era of Cold War, segregation, recession and debates over everything from space travel to statehood for Alaska—he only had to file one cloture motion to end a filibuster. Since Harry Reid became Senate minority leader in 2007, he has had to file 420 cloture motions to end filibusters. And while he usually has majority support for acting on a bill or an appointment, he rarely has the sixty-vote super-majority required by McConnell. The question of whether McConnell will be able to maintain his fourth branch of government, and with it what Sanders describes as “the tyranny of the minority,” may well come to a head Tuesday. Reid has scheduled confirmation votes on seven presidential picks: National Labor Relations Board members, as well as nominees to head the Labor Department, the Export-Import Bank, the Environmental Protection Agency and the Consumer Financial Protection Bureau. If McConnell and his caucus abuse the filibuster in order to block those votes, Reid says he will ask the Democratic majority—and any Republicans who might favor majority rule—to end the tyranny of the minority when it comes to the appointment process. The majority leader, who has blinked in previous wrangling over rules reforms to end the abuse of the filibuster, seems finally to be prepared to take the small step of changing Senate rules—with the approval of a majority of senators—to allow a majority of senators to demand simple up-or-down votes on whether to confirm presidential appointments. “This is really a moment in history that circumstances dictate a change,” says the majority leader. Reid notes that a mere twenty nominees were filibustered during the history of the republic up to the election of President Obama. 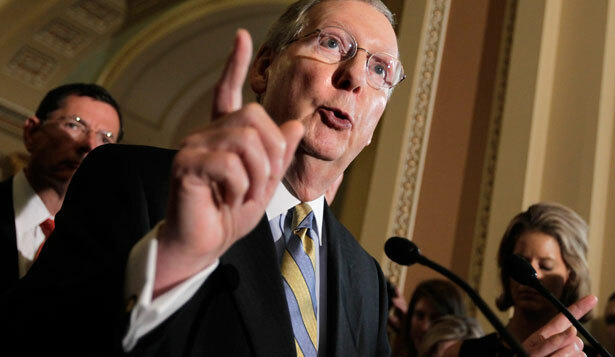 Now, says the majority leader, Republicans have filibustered fifteen of Obama’s executive-branch nominees. McConnell knows better. But he is furious about the prospect that his rogue operations might be restricted. Anti-immigration reform activists protested on Capitol Hill today, complete with nativist signs and racist speeches.